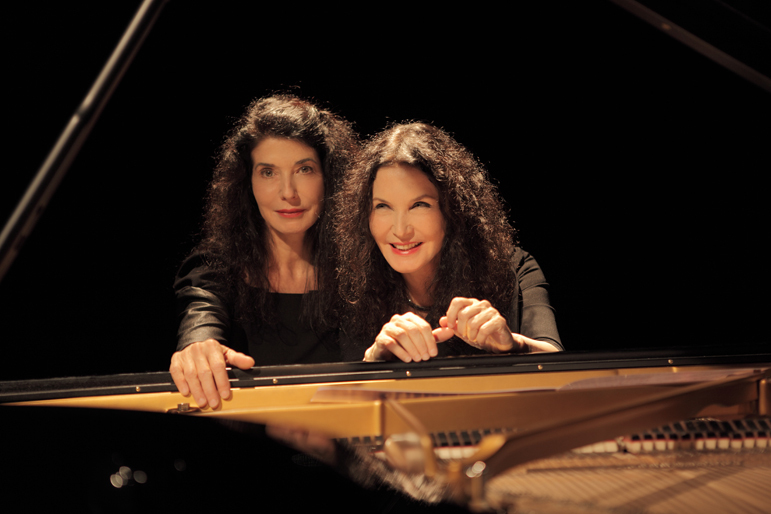 Katia and Marielle Labèque are more than sisters and internationally acclaimed pianists. There’s something in their bond that goes beyond genetic; it’s something that taps into the soul level. They may be daughters of Ada Cecchi, who was a pupil of pianist Marguerite Long, and passed on to them her love for classical music but these details feels more like faded information on a passport than a blueprint for their future. In fact, meeting Katia and Marielle is like standing in front of two very distinct mirrors reflecting each other as they play along the same harmony. Their talent is not the result of a solitary gene showing up, uninvited, in their DNA; Katia and Marielle recognized their artistic place in the world from an early age and ignited it with a passion that revolutionized the classical world, starting with their contemporary rendition of Gershwin’s Rhapsody in Blue that became one of the first gold records in classical music. As I see them taking the stage at the London Festival Hall, where they will play Poulenc’s Concerto for two pianos and orchestra, led by Spanish conductor Juanjo Mena, I recall my phone conversation with Katia. The punchy and acerbic Concerto begins, I understand that despite the innate nature of talent, Katia and Marielle’s synchronicity is not a mere family affair but a true passion for a journey called life and living for art. An ever experimental journey that may just be better shared and enjoyed between siblings. “Our lives are so intertwined…” Katia tells me from her apartment in Rome who once belonged to the Borgia family and has been decorated by the grand seigneur of the design world Alex Vervoordt “…and when we’re not travelling together, Marielle travels with her husband”. The other half of the Labèque piano duo is married to prestigious orchestra conductor Semyon Bychkov. “Her life is so difficult to manage having a husband constantly on the road as we are but passion is the key to make it work”. Katia sounds as warm as the sun shining in the a-typically warm winter day in the Italian capital and the passion she speaks with is the same as the one she uses at the grand piano. Time may stand still in the Eternal City but indulging in it is out of discussion for them; “We are musicians and interpreters so being on a stage is essential for us. If we’d be at home the whole time we couldn’t express our musicality. In this respect travelling around the world is a necessity to bring our work to the audience; otherwise it’ll remain a lifeless piece of work. We don’t really get to be tourists but it’s a beautiful necessity”. It’s a lifetime journey started in the Basque region of France, “one of the few places in France where a musical education does not exist though its culture is musically strong” an adventure that brought them together to the most illustrious orchestras in the world, collaborating with composers like Philip Glass and Luciano Berio and to a record-breaking performance attended by more than 33,000 people at a gala concert with the Berlin Philharmonic inside the Berlin’s Waldbühne. 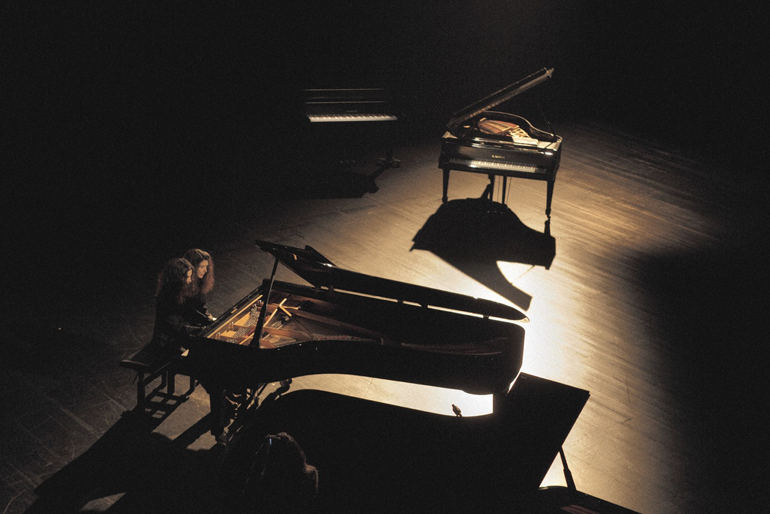 In a classical world where the repertoire for piano duo is limited, Katia and Marielle always had it their way, as the title of their documentary suggests: The Labèque Way, directed by Félix Cábez. Applying the expertise of an artisan they created a body of work of their own, delivering mesmerizing projects that show, and dare, to display exotic combination between the classical world and contemporary art forms. After all Katia is not afraid to mention Radiohead among her favourite composers, along with “Bach, Mozart, Stravinsky in general and Schumann, who in my opinion is not played enough.” I immediately feel that the charm of this lady is not only in the way she speaks Italian but in her nonconforming nature. They brought basque percussions to Ravel’s Bolero with the Kalakan Trio, performed an arrangement for two pianos of Bernstein’s West Side Story arranged by Irwin Kostal and more recently Minimalist Dreamhouse, a project inspired by the early minimalist works that got their exposure in La Monte Young’s 1960-61 Chamber Street Series in Yoko Ono’s New York loft. I’m interested to know how their inspirations come about when choosing a theme to explore and experiment with and most of the times it has got to do with artists or movements that challenged common thinking. “Minimalism for example is an extremely important movement in music history for me. It may very well be the greatest revolution of the last century because it opened the door for rock, pop and a different way of making cinema. Everyone from Brian Eno to Radiohead got in touch at least once with minimalist’s principles. It was a kind of music that wasn’t well received at the beginning and so we recreated the same kind of atmosphere that Yoko Ono created in her loft. We gathered with different musicians in our studio, improvised a lot and discovered many things along the way. It’s an endless project because there are endless possibilities and it all started with our friend Igor Toronyi-Lalic who asked us to play in a minimalist festival at London’s Kings Place, even though we had never played that music before. We are always looking for something new, if we wanted we could have played Gershwin’s Rhapsody In Blue all our lives. Don’t get me wrong, I love it but you have to move on. Recently we have been working on new projects that we are excited about like The Bernard Hermann Concert Project that includes arrangements of Hermann’s music. He was such a great composer who scored many fantastic films by Alfred Hitchock. We are also working on a project about Moondog and his world on NYC’s Sixth Avenue. He used to dress up as a viking and wrote incredible music. A documentary about him is coming out soon. Philips Glass took him under his wing and also Steve Reich was greatly influenced by him. We’ll perform this project as part of Kings Place’s Minimalism Unwrapped programme and it will include also music by Glass and a modern piece from David Chalmin. We want to investigate and show how Moondog inspired Glass but also young composers. He used to live on the street and he was an incredible talent. We are also doing a project with one of Madonna’s break-dancers Yaman Okur who invented a particular style of dancing. It will be inspired by Shakespeare’s Romeo and Juliet and it’s called Star-Cross’d Lovers; the music for this ballet has been exclusively written by David Chalmin. It’s a contemporary Romeo and Juliet for seven break-dancers, two pianos, electric guitar and percussions premiering in May 9th-10th at Paris’s Philharmonie 2 followed by Luzern Festival and later on Dortmund and Bordeaux” Shakespeare’s timeless theme of impossible love has been a source of inspiration for both Chalmin and Okur who, together with Katia and Marielle, managed to break down yet another barrier. On one side, Chalmin shows how rock music, Minimalism or electronics can coexist with classical pianos and in doing so, he paves the way for contemporary music to be closer to pop music without being elitist. On the other hand, Okur is free like his body movements to bring break-dancing from the streets to concerts halls as a piece of art that can be written, choreographed and danced alongside classical soloist. Chalmin’s ability to build bridges between different musical universes has found the perfect chemistry in allies like the Labèque sisters and when this alchemy gets in touch with a visionary choreographer like Okur, these universes collide and come together to create a new symphony that is the very essence of experimentation. Love and hatred through fluctuating dancing, two romantic pianos inspired by Schubert or Chopin, and rock explosions between Capulet and Montague all find a common ground in this unconventionally conceived and produced project. Throughout yet another year’s packed schedule, the Lebèques are performing at the end of May the world premiere of a new Concerto for Two Pianos and Orchestra written for them by Philip Glass. Commissioned by the Los Angeles Philharmonic and conducted by Gustavo Dudamel, this double piano concerto will then be performed in France, Turkey, Sweden and Spain. 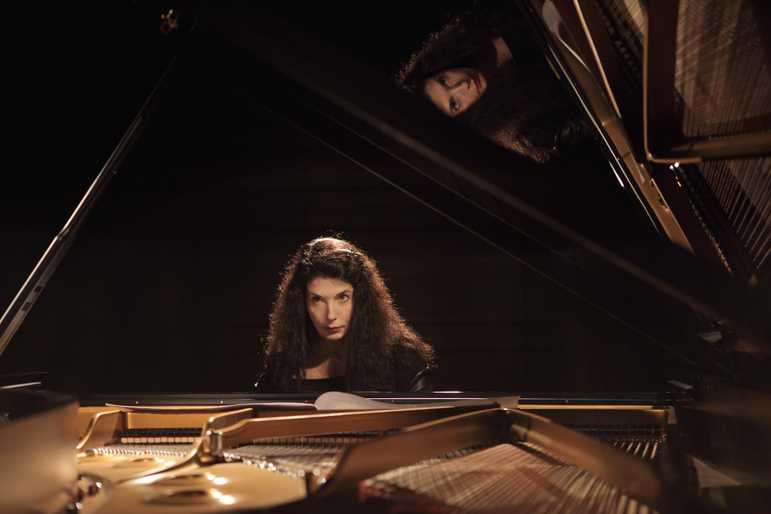 The influential master composer said – “Like many people involved in today’s music I have long been an admirer of Katia and Marielle Labèque’s performance of traditional and new concert music for duo pianos. I was very happy to hear their brilliant playing and interpretative skills with my own music – first with the 2007 work, Four Movements for Two Pianos and then, more recently, the Two Movements for Four Pianos. 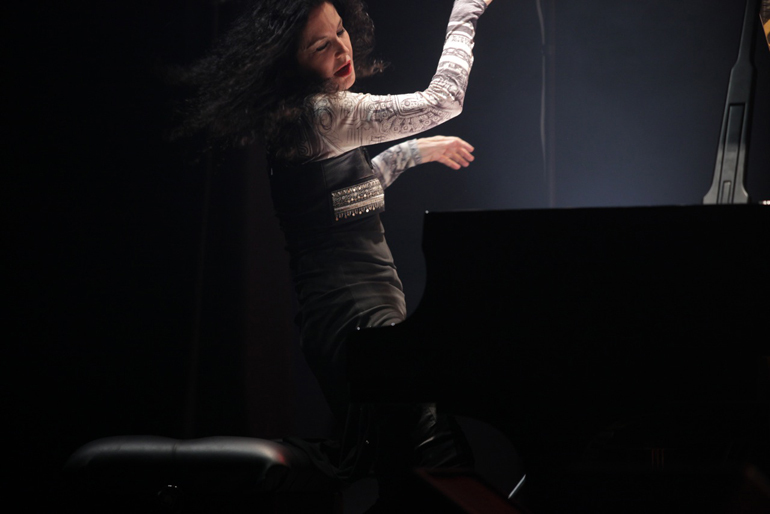 This last work was premiered by the Labèques along with additional pianists Dennis Russell Davies and Maki Namekawa. I was very pleased when they suggested a new work – the present double concerto.” This project promises a new way of experiencing the relationship of the soloist to the orchestra and since both Glass and the Labèques always seek inspiration in the unusual and unexplored, the music of the soloists will be shared between the two and the orchestra will serve to extend the range and color of the soloists. Katia and Marielle Labèque make an impression even when they walk away from the venue and looking at them, talent is not only in the movements of their hands, the knowledge of their minds, in their fighting spirits and the exposure to music within their family. Talent is as hard to describe as the reason why a soul choses to come to life in a certain body. Reason may tell us that the Labèque future was inevitable, but when our heart is touched by their passion, talent is nothing more than “seeking the echo rather than the refrain and preferring discovery to repetition.” Their uniqueness won’t be repeated even with their DNA but Katia has her own “piece” to pass on to the future “The only thing that can make you strong is years of experience and love for music. It’s the willingness to hand down to someone your knowledge.